With the financial markets likely to enter 2019 having just had the worst December since the Great Depression, there have been many stocks that have taken a beating the past month. Abbvie (ABBV) has not been exempt from this market plunge as it has fallen nearly ~27.6% from its all-time high of $125.86 a share in January 2018. Moreover, Abbvie has fallen ~3.3% since the beginning of December, from $94.27 a share to $91.12 as of close on December 28, meaning the company has been hit harder than other pharma stocks this year. In addition to concerns over Abbvie’s concentration risk with Humira, another concern in the past 9 months to the investor community was Abbvie’s announcement this past March that it wouldn’t pursue accelerated approval for Rova T to treat RR SCLC, due to disappointing Phase 2 results. Although the company will move forward with the ongoing Phase 3 studies, investor consensus is that the $10.2 billion StemCentryx acquisition, once thought to be a promising oncology acquisition, will instead prove to be a bust. Consequently, the company’s shares have not rebounded to the $110+ range the shares were at January through most of March. As such, I believe that Abbvie is currently worthy of a dividend growth investor’s consideration. There are three main reasons to support my opinion that Abbvie is an attractive investment, worthy of further due diligence from a potential investor. The first reason is that although its dividend history as an independent company has been brief, it has been spectacular, and I believe it will continue to deliver solid dividend increases going forward. This leads me into my second point that Abbvie has the appropriate drug pipeline to offset the eventual declines in revenue from Humira, which would lead to continued strong dividend increases. Lastly, the company’s current valuation is appealing. Since the formation of the company in 2013 as a spin-off of the biopharmaceuticals division of Abbott Laboratories, Abbvie has raised its dividend each year. Abbvie is technically a dividend aristocrat when we factor in its former parent company’s 46 years of consecutive dividend increases. The company recently announced an 11.5% dividend increase from $0.96/share quarterly to current quarterly dividend of $1.07. Using the company’s midpoint earnings guidance of adjusted diluted EPS of $7.91/share for FY 2018, we can see that the payout ratio in terms of EPS is 54.1%. This is about where I’d like a pharma dividend payer to be at as it leaves the company plenty of capital to invest in the research and development that will be necessary to develop new blockbuster drugs in the future, not to mention also returning capital to shareholders in the form of share buybacks when the company’s shares are attractively priced. Moreover, we can examine the company’s free cash flow numbers to arrive at the FCF dividend payout ratio. Per the company’s most recent financial release, Abbvie has generated FCF of $9.5 billion while paying $4.1 billion in dividends during that time. This would mean the payout ratio using FCF is roughly 43%. Both methods of gauging the company’s payout ratio show us that the dividend is clearly safe and reasonable, allowing raises fairly similar to the most recent of 11.5%, while still heavily investing in the company’s future through R&D. With a dividend yield of 4.7%, it is wise to question why the yield is so high currently. This leads us into our next point in which we’ll discuss the risks that Abbvie is facing, and why I believe these risks are being more than factored into the company’s stock price. The primary concern that investors have had with Abbvie for several years is that Abbvie is too reliant on Humira. They conclude that because Humira accounts for 62% of Abbvie’s revenue as of Q3 2018 and 70%+ of its profits, when Humira sales eventually decline, the company’s prospects will also decline. The company is currently facing tough biosimilar competition in the European Union as competitors such as Amgen, Biogen, Mylan, and Norvartis releasing biosimilar versions of Humira. With discounting of Humira ranging from as low as 10%, to as high as 80% in Nordic countries, international Humira sales are expected to decline 26-27% in 2019, per Reuters. Although this isn’t the most encouraging news, the bulk of Humira’s sales are generated in the United States. 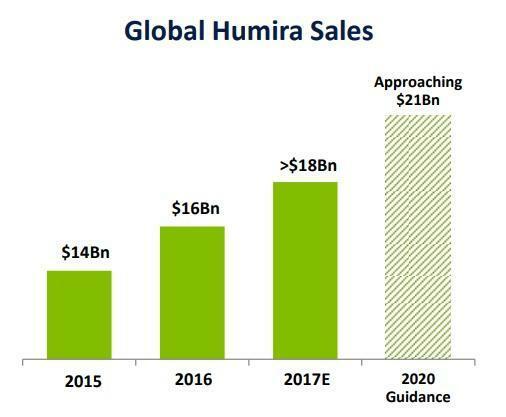 Assuming a 27% decline in international Humira sales, the company’s international sales will decline by $1.7 billion. This would equate to a ~5% sales overall sales decline by itself. However, with strong Humira patent protection in the US, Abbvie won’t face any rival biosimilar Humira drugs in the US until 2023. In the meantime, Humira sales will continue to grow at a clip of roughly 10-12% in the US, before peaking at $21 billion in total sales in 2020. This would equate to an increase in Humira sales of nearly $1.4 billion to $1.6 billion. An overall decline in Humira sales of $100 million to $300 million would mean that the company will see a revenue decline of less than 1% in 2019, not accounting for any growth experienced from other drugs on the market or in the pipeline. Abbvie’s management recognizes the threats posed by concentration risk from Humira and they have developed a corporate strategy focused on extensive research and development to drive innovation, and deliver results to shareholders in the process. In the Oncology division, Venclexta and Imbruvica offer a lot of promise to Abbvie. Venclexta earned FDA approval for the treatment of chronic lymphocytic leukemia (CLL) in April 2016. Upon examining Venclexta, we can see that Fierce Biotech is estimating that Venclexta could generate peak sales of $2 billion if it earns up to three separate breakthrough designations, which could potentially occur. Moreover, Imbruvica has shown tremendous promise and it appears as though the 2022 sales forecast by Fierce Biotech of $8.29 billion could prove to be accurate. According to the Abbvie news release, sales of Imbruvica totaled $972 million, representing a 41.3% YOY growth. It’s easy to see how these two oncology drugs alone could offset quite a bit of revenue decline in Humira over the coming years. Moving to the immunology segment, the two most promising late-stage assets include Risankizumab and Upadacitinib. After a Phase III sweep by Risankizumab, it is reasonable to conclude that Risankizumab will be able to easily take market share from older drugs, such as Stelara and Abbvie’s own Humira. The only question regarding how much Abbvie is able to monetize this drug lies in how well it can compete with other newer, similar drugs including Eli Lilly’s Taltz, and Novartis’ Cosentyx as both of those drugs also delivered promising results in treating psoriasis. The blockbuster potential is there as Abbvie projects that Risankizumab could mature into a drug with peak sales of $4-5 billion. Regarding Upadacitinib, there is guidance from Abbvie that the drug could mature into $6.3 billion in sales by 2025. This seems like a reason estimate, given that recent studies have shown the drug’s remission rates are 66%, double that of the standard of care (Methotrexate). The concern with Upadacitinib is the possibility that it may not be able to avoid fate of the black box warning cautioning against thrombosis that Eli Lilly’s Olumiant was forced to comply with when the FDA approved Olumiant with that caveat, in addition to only clearing the use of Olumiant in patients that have already tried drugs, such as Humira and Enbrel. If Upadacitinib is able to avoid the black box warning, it absolutely could become a $6+ billion blockbuster for Abbvie. I believe that the data of one adverse event out of the 631 patients treated with Upadacitinib in the trial is encouraging, but as with all pharma stocks, we won’t know for certain what the future holds for Abbvie’s recent Upadacitinib submission to the FDA until the company receives a decision from the FDA. Finally, moving into the focused investment segment of Abbvie, we will discuss the most promising drug in that segment. As seen above, that drug is Elagolix aka Orilissa. Orilissa is the first FDA approved oral treatment for moderate to severe endometriosis pain in over a decade. The most encouraging news to come out of the FDA approval is that regulators green-lighted the product at two dosage strengths, without adding a black box warning for bone mineral density changes. This likely de-risks Orilissa and means that it could become the standard of care in treating moderate to severe endometriosis, a largely under-served market. Ultimately, Goldman Sachs analyst Jami Rubin believes that the drug could generate sales of $1 billion a year by 2020, and $2 billion a year by 2025 if industry experts are correct in their prediction of a uterine fibroids OK from the FDA by 2020. Although the above figures that have been provided on the sales potential of the aforementioned drugs are just estimates, I believe these estimates are reasonable and even if some prove to be incorrect, it only takes one or two blockbuster drugs to be able to offset the eventual revenue declines in Humira, and drive earnings growth for years to come. One final bearish concern present in the entire pharma industry is the worry that the government will eventually place more stringent pricing regulations on the drugs that Abbvie and other pharma giants produce. Back in July 2018, President Trump criticized and vaguely threatened Pfizer after it announced price hikes on over 40 of its drugs. Although this has been an issue that politicians have talked about for some time, as prescription expenditures rise and threaten to destroy Medicare budgets, it is reasonable to conclude the government will face no choice but to eventually take action to more stringently regulate drug price hikes, unless the billions of lobbying dollars by pharma continue to convince legislators to continue to ignore the issue. If/when this more stringent pricing regulation does happen, this would be a blow to the pharma industry as a whole, causing margins to crater. I don’t believe that this is an immediate threat to Abbvie or other pharma companies because as we all know, the federal government generally defers issues for years at a time. However, I do believe this is a risk that must be carefully monitored by investors in the pharma industry, in order to be proactive rather than reactive to a potential headwind in the industry. 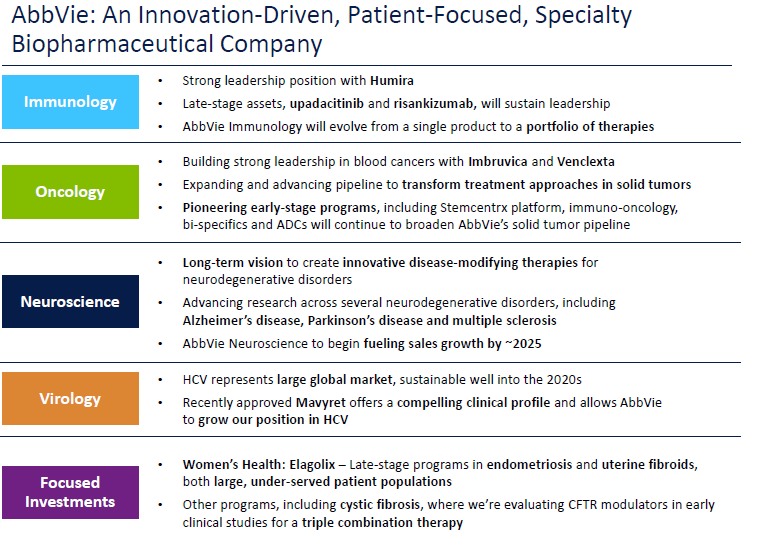 In summary in regards to Abbvie’s growth story moving forward, I believe that Abbvie’s growth platform pitched in the above slide isn’t just another rosy picture that is portrayed by management. We haven’t even covered promising drugs in Abbvie’s early to mid stage development phase, so the thought that Abbvie could reach $35 billion in non-Humira sales by 2025 seems reasonable. The growth that is likely to occur in Imbruvica of another $4+ billion in sales by 2022, in combination with Venclexta peak sales of $2 billion, $4-5 billion from Risankizumab, $6+ billion from Upadacitinib, and $1-2 billion from Orilissa more than offset the projected $9 billion decline in Humira sales from 2020 to 2025. 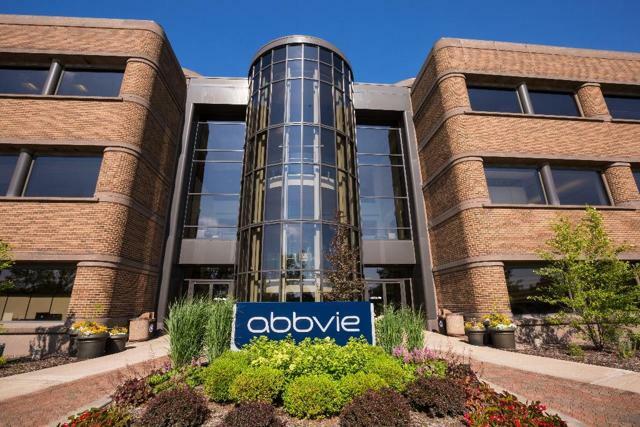 Even factoring in a couple of disappointing results in Abbvie’s pipeline, Abbvie shouldn’t face the same fate of over-reliance on one drug as Gilead Sciences did when its blockbuster Hep C drug, Harvoni experienced a sudden decline in sales. Having examined various drugs of Abbvie’s, both currently on the market and in development, there is certainly a lot of potential for growth moving forward. Having examined the company’s current dividend yield and the risks/opportunities that Abbvie is presented with, this leads me into my next point. The above analysis would be all for naught if I didn’t believe that Abbvie’s current price is compelling for those willing to tolerate the risks mentioned above. Though the stock has since rebounded strongly from its 52 week low of $77.50 a share, the December 28 share price of $91.12 represents a solid buying opportunity. Abbvie’s current dividend yield of 4.7% compares very favorably to the 5 year average yield of 3.5%. If the company’s yield reverts back to its average yield of around 3.5%, this would result in a 34.3% increase in the stock price. This would translate into a current stock price of $122.36, which isn’t far off of what the stock’s 52 week high was in January. Of course, I can’t accurately predict if or when the company’s yield will revert back to 3.5%. It may take several years for Abbvie’s yield to revert to around 3.5% as the market waits for Abbvie’s diversification away from Humira to play out. Moreover, the company’s earnings midpoint of $7.91 for FY 2018 compared against the current price of $91.12 means that Abbvie is sporting an 11.5 PE ratio. For a large-cap pharma stock with a projected 5 year annual growth rate of nearly 17%, this is an attractive entry point. 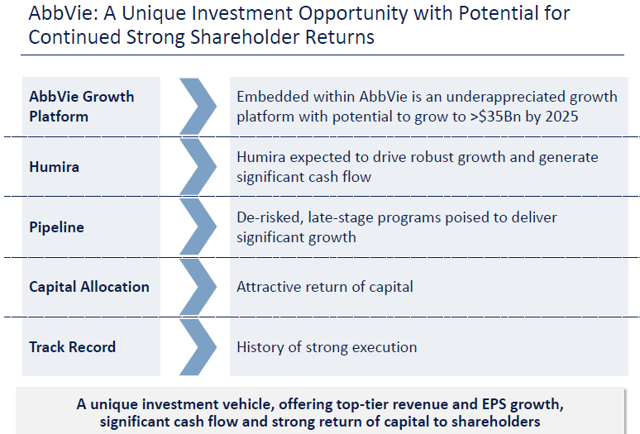 It is my opinion that Abbvie’s dividend is currently safe and unless Abbvie is unable to offset eventual declines in Humira revenue (which I view as unlikely), the dividend should remain safe and continue to grow going forward. As with any company, an investor must consider the future of the company, industry/company risks, and valuation, before making an investment. The biotech space faces their own set of risks, including concentration risk, patent expirations, generic competition, pipeline issues, and regulatory risks. Despite Humira set to face stiff biosimilar competition in the United States starting in 2023, I believe Abbvie has the pipeline necessary to more than offset the eventual revenue declines in Humira, driving future growth. As far as regulatory risks go, the risks that Abbvie faces are risks that its industry peers are also facing. Increased public and government scrutiny regarding drug price increases is a concern, but without rewarding companies such as Abbvie for serving the unmet health needs of patients, the outcome of a full-fledged regulatory backlash against pharma companies is one the United States and the world in general can’t afford. I don’t view this risk as an immediate risk, but one for investors to monitor coming years. At the current stock price, I believe that the bearish arguments are being given too much credence, while the bullish arguments are not being given enough. This is the reason for the current disconnect between Abbvie’s stock price and its true valuation, from an objective standpoint. Abbvie’s 4.7% dividend yield and an 8% 5 year earnings growth rate (less than half the projected ~17% and just over a third of the previous 5 year growth rate), offers a 12.7% annual return over the next 5 years, assuming a static valuation multiple. Despite these perhaps overly conservative assumptions, Abbvie still offers one of the more compelling investment opportunities in today’s market for those who can tolerate the risks. I believe this creates an attractive entry point for both those considering initiating a position in Abbvie or those looking to add to their position. Disclosure: I am/we are long ABBV. I wrote this article myself, and it expresses my own opinions. I am not receiving compensation for it (other than from Seeking Alpha). I have no business relationship with any company whose stock is mentioned in this article.